After staying in the first night at Anedin Hostel, for the rest of our Stockholm trip we stayed in Gamla Stan, the old town, at Mälardrottningen Yacht Hotel. The hotel room is actually a cabin in a ship on lake Mälaren. The cabin was quite small, but the feeling living on a ship was quite nice. And the breakfast was really good. In our second day, as the weather was still not that good, we spent it indoors as well. This time, it was time for some Nordics history and culture lessons. Stockholm is the capital and largest city of Sweden, with nearly 2 million inhabitants within its vicinities. 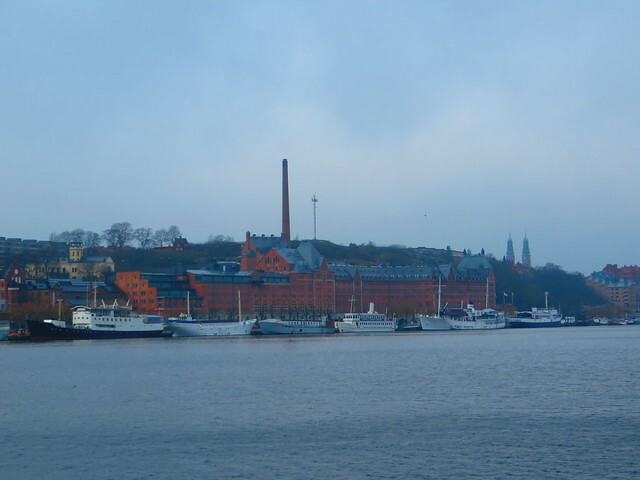 The inner city is made up of 14 islands connected by some 50 bridges on Lake Mälaren, which flows into the brackish Baltic Sea, and passes the Stockholm archipelago with some 24,000 islands and islets. Stockholm is a cosmopolitan place with both classical and modern architecture, and a captivating Old Town, Gamla Stan. Over 30% of the city area is made up of waterways, and another 30% is made up of green spaces. Air quality is fourth best of the European capitals – behind Zurich, Copenhagen and Vienna. Stockholm is not the oldest town in Sweden. As Sigtuna, Sweden’s first capital, was sacked by pirates in 1187, the Swedes built up fortresses along the inlet of Mälaren, and Birger Jarl (Jarl is a title corresponding to British Earl) had a fortress built on an island later known as Gamla Stan. The first records of Stockholm were written in 1252 by Birger. As the land raised, the Stockholm straits became the only waterway between Mälaren and the Baltic Sea during the 15th century, replacing Uppsala as the effective capital. Since King Gustavus Vasa liberated Stockholm in 1523, Stockholm has remained Sweden’s most important centre of commerce, though Gothenburg later became the largest international port. During the 17th century, Stockholm was the base of the Swedish Empire, with a land area twice the country’s current size, nearly encircling the Baltic Sea. The city contains buildings from all ages since the 13th century. Like the rest of Sweden it was untouched by the World Wars, but particularly between 1955 and 1975, hundreds of old buildings in Norrmalm were demolished in a large-scale modernization process, encouraged by similar projects in other European cities. Since then, only infills and a few areas have been developed with new architecture in central Stockholm. Our first stop for the day was the Vasa Museum (entrance ticket included in the Stockholm Pass). The Vasa Museum (Swedish: Vasamuseet) is a maritime museum in Stockholm, Sweden. Located on the island of Djurgården, the museum displays the only almost fully intact 17th century ship that has ever been salvaged, the 64-gun warship Vasa that sank on her maiden voyage in 1628. The Vasa Museum opened in 1990 and, according to the official web site, is the most visited museum in Scandinavia. The main hall contains the ship itself and various exhibits related to the archaeological findings of the ships and early 17th century Sweden. Vasa has been fitted with the lower sections of all three masts, a new bowsprit, winter rigging, and has had certain parts that were missing or heavily damaged replaced. The replacement parts have not been treated or painted and are therefore clearly visible against the original material that has been darkened after three centuries under water. The museum is dominated by a large copper roof with stylized masts that represent the actual height of Vasa when she was fully rigged. Parts of the building are covered in wooden panels painted in dark red, blue, tar black, ochre yellow and dark green. The interior is similarly decorated, with large sections of bare, unpainted concrete, including the entire ceiling. Inside the museum the ship can be seen from six levels, from her keel to the very top of the stern castle. Around the ship are numerous exhibits and models portraying the construction, sinking, location and recovery of the ship. There are also exhibits that expand on the history of Sweden in the 17th century, providing background information for why the ship was built. A movie theater shows a film in alternating languages on the recovery of the Vasa. Next to the Vasa Museum, there’s the Nordics Museum which we also paid a visit if we were in the area. It’s a museum dedicated to the way of living of the Nordics, their traditions and culture. Very helpful to have visited this place as it gave us an insight of how Swedish people build their families, their lives, which are their values. The Nordic Museum (Swedish: Nordiska museet) is a museum located on Djurgården, dedicated to the cultural history and ethnography of Sweden from the early modern period (in Swedish history, it is said to begin in 1520) to the contemporary period. The museum was founded in the late 19th century by Artur Hazelius, who also founded the open-air museum Skansen. The present building, the design of Isak Gustaf Clason, was completed in 1907. Originally, it was intended to be a national monument housing the material inheritance of the nation. It was, however, only half-completed for the Stockholm Exposition 1897, and it never was completed to the extent originally planned, three times the actual size. It takes its style from Dutch-influenced Danish Renaissance architecture (i.e. buildings such as Frederiksborg Palace) rather than any specifically Swedish historical models. The core of the “cathedralesque” building is taken up by a huge main hall passing through all the stories up to the roof and dominated by the enormous sculpture of King Gustav Vasa, the Swedish so called founder-king. The museum has over 1.5 million objects in its collections, including buildings such as the Julita farm in Södermanland, Svindersvik in Nacka, Tyresö Palace in Tyresö, and the chaplain farm at Härkeberga near Enköping. The museum archive also houses an extensive collection of documents and photographs. For the rest of the day, as it was already late in the afternoon and the weather was finally getting better, we had a very nice walk in the Djugarden area, which is the royal park area, with a lot of green spots and beautiful architecture. After all the walking we started to look for some traditional Swedish or scandinavian restaurant, but everything was so expensive, that in the end, hungry and tired we had to settle for some Thai food :). We had dinner at Ja Thai Wak & Sushi a small restaurant/take away on Hornsgatan, near Gamla Stan and Slussen. Actually I was not bad at all and we returned the next day. We ended the day and a nice walk at night to our hotel.